Only showing entries about cost from A Longwinded Journey South. View entries about cost from all Travellerspoint blogs. Due to Amy's impressive frugalness and my economic training we are keeping an accurate record of expenses. Overall Colombia was more expensive than we expected and we were a little discouraged at times about how fast our money was flying out of our pockets. This was partly due to the majority of our time being spent in cities, general high cost of long-distance bus travel, and figuring out how best to travel on a budget and spend smartly. The repeated balancing act we have to play with our money is how much to splurge for activities/foods/cervezas in the present and how much to deprive ourselves of entertainments/experiences/pleasures now in order to see more of the continent down the road. In one sense you want to spend what is necessary to enjoy your time in a place and try new things but on the other hand you must remember that most of your trip money must be spent on cheap food, budget lodging, and transportation in order to continue the journey. This can be a very difficult task individually and even more so when trying to coordinate the desires, preferences, and needs of two companions. Amy and I have certainly had some disagreements in this regard but we are getting better at it as we go. In Colombia we divided expense into five catagories but have since added a sixth called Necessities which includes bathroom fees, internet costs, toiletries, and other expenses we deem necessary while Other now encompasses all unnecessary expenditures. 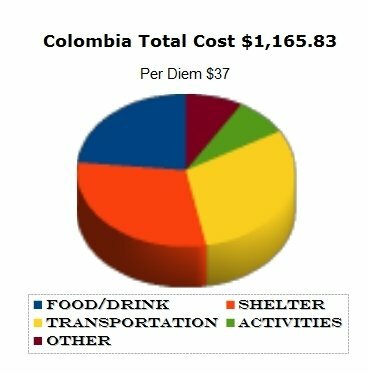 As you can see transportation and shelter were the majority of our costs over our thirty one days in Colombia. Our two longest bus rides from Bogota to Medellin and then from Medellin to Neiva were a little over thirty dollars each. All the shorter rides and more local bus and metro rides added up (we took a few taxis with others in Bogota and Medellin but only once by ourselves to find our couchsurfing destination in Medellin). Much of our lodging cost is the payment of our first WWOOFing experience outside of Bogota at Organizmo which charged $165 per person for two weeks. This cost did include three meals a day (which were delicious, the consistently best and by far the healthiest we have had) and was certainly worth the experience. Unfortunately we had some difficulties resolving payment in Colombian pesos and how the decreased value of the dollar factored into that payment. WWOOFing can be a tricky process when both parties (host and volunteer) have different expectations. As a volunteer I always try to fulfill work requirements and be ready to help with anything. I think this works best when there is no payment involved and you have the general goal of earning your keep and working for your food and shelter. No matter what the circumstances there is always the chance of a volunteer feeling taken advantage of or a host or often even both at the same time. CouchSurfing dynamics are simpler but can be difficult as well. I have found myself wondering why these people are taking us in for free and then feeling like I must provide something, whether it be interesting conversation, food preparation, dish washing, information, anything to make up for the fact that we are strangers being treated kindly as guests. I am trying to change my way of thinking and not see these interactions as exchanges but instead try to focus on the simple, unquantifiable, social sharing and learning between humans that is at the heart of them all. We have volunteered at three WWOOF hosts (an educational center, family farm, and garden/orchard) and stayed with three different CouchSurfers and all have been astoundingly different and positive. In general these experiences have cost the least and been the most rewarding of the trip. Most of our money has gone to getting from place to place and feeding ourselves (which probably come in second and third in terms of rewarding aspects of the trip). $1,165.83 is a lot of money but we did a whole lot with it in Colombia and were able to stay under twenty dollars per person per day. This was the general guidline I had found for budget travel in Colombia. Ecuador is proving to be cheaper and we should be closer to 10-15 dollars a day during our time in Ecuador, Peru and Bolivia. Hopefully we will have some money left after that to brave the near European prices of Argentina and Chile. Who knows if we will have the funds after that to cough up the $100+ visa fee for entering Brazil. Only time (and money) will tell.